A ferret cage comes in different shapes and sizes. Not to mention price ranges. You can make one from scratch, remodel a cabinet of buy a brand new one the shop. It’s the most important of all ferret supplies, so here are few tips to get it right the first time. Even if you already have fuzzies, check out these tips to make sure they’re housed properly. TIP: Want to save some money? 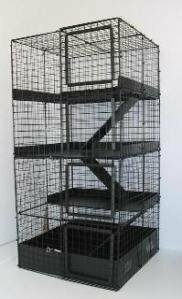 Check out my tips on buyingÂ used ferret cages here. Buy a cage that’s easy to clean. Metal cages (galvanized) are the best when considering hygiene. Plastic cages can get scratches which will be more difficult to clean. Wooden cages typically need a few coats of varnish to make it easier to clean them and to prevent any fluids from being absorbed by the wood. Besides the material it’s made of, you’ll also want to look at how it’s build. Removable shelves are a treat to clean, as is a removable floor. A cage that you can open completely is your best choice. That way you won’t have be a yoga enthusiast to clean every little nook and cranny. Big doors are also easier to remove and replace the litter box, hammocks, tunnels and other toys. The size will depend on your budget and available space. But also on how much your carpet sharks get to ‘free range’. Going up is usually a good idea. Multiple levels will save floor space if you live in a small apartment. It will also keep your ferrets a little bit fitter as they need to use all their muscles to climb and jump from one level to another. The absolute minimum size of a cage for 1 or 2 fuzzballs is 3ft wide x 2ft deep x 2ft high. Your fuzzies will need lots of playtime outside of their cage of you choose one this small. If you have more than 2, going up is definitely your best option. Multilevel cages provide enough room to divide it up in a sleep, eat and poop area. Multilevel cages have ramps (or tunnels) to go from one level to the next. Some people recommend ramps made of wire instead of smooth material. However, I’ve heard horror stories about fuzzballs injuring themselves on the wire. Obviously, solid ramps, can act more like a slide. So look for one that doesn’t have a completely smooth surface. Some brands even offer special ramp covers. If you decide to get a multilevel cage (or already have one) make sure all ferrets can access all levels. Older fuzzies will have trouble climbing up to the top level, so make sure they have all they need at the bottom level. I still have the small, single level cage I first bought. It’s very convenient and I like to keep it handy as a sick bay. When my fuzzies where neutered I put them in there so they couldn’t climb and possibly tear stitches or anything. I’ve also used it to separate both of them when Stitch suddenly became sick. It’s also handy in case something should go wrong with your other cage. As your fuzzies will spend most of their time in the cage eating, sleeping and using the litter box (or avoiding it at all cost), the cage needs good ventilation. And no, aquariums do not make good ferret cages. Lots of bars or wire on the other hand are good. Which leads me to the temperature inside the cage. Ferrets can’t control their body temperature very well. So it’s up to you to control the cage and room temperature where the fuzzies live. Avoid placing the cage in front of a radiator or window. Give them warm and cooler bedding so they can choose in which they want to sleep. Ferrets are real masters of escape. Of course it doesn’t help to have a dog who figured out how to open the cage door to get to the fuzzies food either…Anyhoooooo, if there is too much space between the bars, they will squeeze their little bodies through it. If the latches don’t close properly, you can be certain they’ll figure out how to open them. Snap hooks are a simple and cheap solution to keep your fuzzbutts safely inside their cage (and your stress levels to a minimum). As mentioned above, fuzzies can seriously injure themselves on wire. Floors made of wire are best covered, either with lots of bedding or something more permanent. The squares shouldn’t be larger than 1/4inch. You could cover the wire floor with left-over carpet. This can be really difficult to keep clean and will certainly keep the ferret’s odor. Not only that, your fuzzy can also snag his nails on it. A better option is to use linoleum. It’s easy to fit, easy to clean, doesn’t hold odor and poses no threats to your fuzzbutts health. What holds true for real estate holds true for your ferret cage. What’s more, your fuzzies health and happiness depend on it. Avoid any cold or hot air blowing directly on the cage. Don’t put it in front of a radiator or vent. Dust and other small particles that are blown into the cage because of this can cause infections, respiratory problems and even eye irritation. If you have to place the ferret cage in a basement of any other damp room, use a dehumidifier. Poor ventilation and dampness are perfect breeding grounds for bacteria. Especially combined with a litter box and food. Fuzzies sleep a lot. To remain healthy and not to disrupt their cycle too much, they shouldn’t be kept in a brightly lit room 24/7. Some cages come with a cover. Another option is to place a box with only one entry hole inside the cage where they can sleep in darkness. I’ve used a simple cardboard box, but you can build one yourself or buy a bird’s nest box as well. Whenever the box becomes dirty or torn I just throw it out and replace it. If you like to turn on your stereo or TV so loud the whole street can hear it, don’t place the ferret cage next them. Loud noises can totally stress out your fuzzball. Not to mention interrupt their sleep.